﻿Based on the last five years experience of selling wingless hurdles we have decided that there is little demand for some of the designs and we now offer just the one very popular design, the Whyframe Safety version. 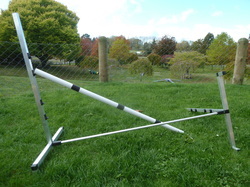 This version utilises a round spreader bar which allows the upright to tip away from the dog in the case of a serious crash. The low profile feet do not create a trip hazard for the handler and gives the dog an unimpeded path when slicing or wrapping. The design utilises injection moulded plastic joiners which are guaranteed for life. The four way joiner is designed to break under side load and will be replaced free of charge in such cases. We much prefer to see a broken joiner than a broken dog. The hurdles come as flat pack kit sets to reduce freight costs and all that is needed to assemble them will be a rubber mallet and a block of wood. The hurdle cups are black nylon and made to fit a 32mm hurdle bar. They come with a strong industrial self adhesive on the reverse of the back plate. Cups can also be pre-installed at correct heights prior to freighting. Alternatively they can be pop riveted in place on request. These cups are designed with dog safety in mind. 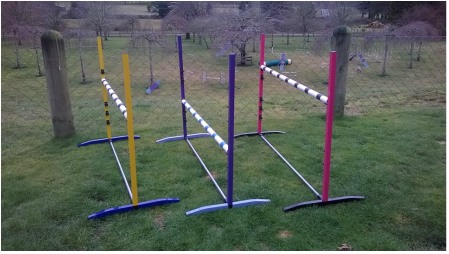 One bar of 1200mm length will be supplied and each will have three bands of colour (Black, Blue, Green Lemon, Red, Orange or Lilac) or a combination, for contrast and to aid visibility for the dog. All the great features of our designs but with the added safety of a round spreader bar which allows separate tipping of each upright. If a dog knocks one side the hurdle will not cartwheel as with traditional hurdles. Aluminium version weighs just 1.5kg and the galvanised steel version 2.5kg.